The Final Draft Outcome Document of the Global Compact for Safe, Orderly and Regular Migration (GCM) was transmitted to the United Nations General Assembly by its President on 13 July, 2018. It was approved by consensus of the United Nations Member States. Final Draft. It will now go forward for adoption at the Intergovernmental Conference to adopt the Compact in Marrakech, Morocco on December 10 and 11, 2018. 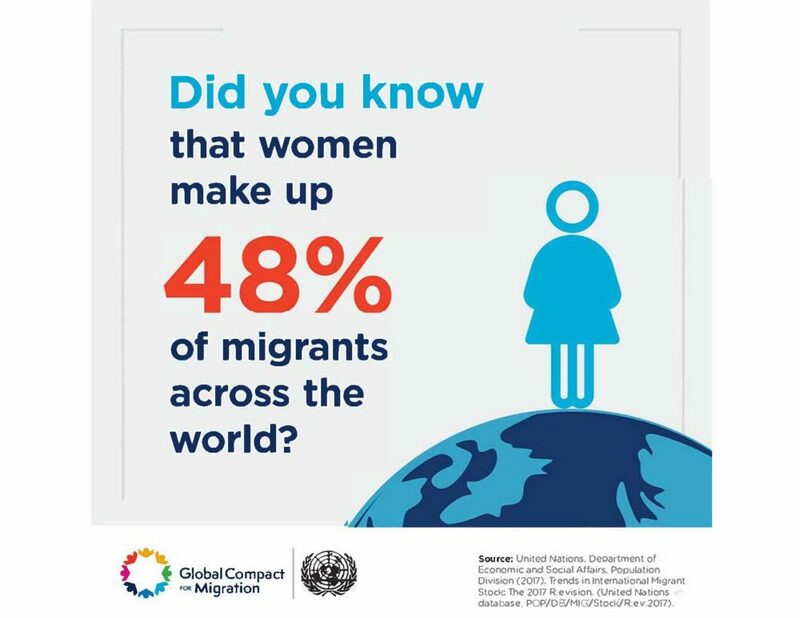 Women represent half of the estimated 258 million international migrants. In 2017 UN Women issued a comprehensive document entitled, Recommendations for addressing women’s human rights in the global compact for safe, orderly and regular migration – Outcome of expert meeting in Geneva, November, 2016. This document promoted and sought to protect the rights of women at all stages of migration, highlighting the principles of equality and non-discrimination. It emphasized the need for a human rights-based and gender-responsive approach, recognizing the global structural drivers of migration and inequalities in the migration process. Much of that thinking is reflected the GCM. Outcome document. Similarly, Soroptimist International (SI) recognizes that the human rights of all migrants and refugees, and particularly the rights of women and girls, must be protected. They often encounter danger and find themselves in situations of vulnerability when on the move, crossing borders or arriving at countries of destination. SI support for migrants is clear from our statement, Where We Stand on Migration. Statement. Numerous projects have been undertaken by SI club members to provide assistance and support for migrants and refugees in many parts of the world, from the Netherlands to Turkey, Norway, South Korea and to many other places within SI’s regions worldwide. Our UN Representatives have worked on migration issues in Geneva, Paris, New York and elsewhere, and SI leadership has encouraged SI participation in the GCM process. The GCM contains cross-cutting provisions promoting concrete gender-responsive policies and the empowerment of women as agents rather than “viewing them through the lens of victimhood.” It fosters conditions for decent work and upholds the best interest of the child at all times. In August 2018, SI joined more than 100 civil society organizations in signing the Joint Civil Society Statement at the Conclusion of Negotiations on the Global Compact for Migration. Statement. This Statement highlights some of the positive provisions of the Final Draft of the GCM but does not ignore its weaknesses. Members of civil society are asked to contact their national governments and urge them to support adoption of the GCM. At a High Level Summit on September 19, 2016, all 193 Member States of the United Nations unanimously adopted the “New York Declaration for Refugees and Migrants” (NYD). Declaration. It set out a process for the development of two global compacts, one for refugees and the other for safe, orderly and regular migration to be adopted in late 2018. Refugees have been covered by the broad scope of the 1951 Refugee Convention and its 1967 Protocol and they are also covered by regional instruments. The NYD contained strong commitments to refugees and migrants. It presented a framework for the very first global compact on migration, expressing the political will of world leaders to “save lives, protect rights and share responsibility on a global scale.” It reflected the general agreement at the time, that the two compacts would benefit refugees and migrants but would also significantly benefit host countries and communities. The Co-Facilitators of the GCM are UN Ambassador Juan José Gómez Camacho (Mexico) and UN Ambassador Jürg Lauber (Switzerland.) They undertook an “unprecedented amount” of data gathering and review of evidence, “during an open, transparent and inclusive process.” That process took almost two years. There were numerous international and regional fact finding meetings, meetings with Member States, consultations, informal thematic sessions and dialogues with stakeholders, including civil society organizations, academic institutions, the private sector, diaspora communities and migration organizations. SI UN Representatives attended such meetings and participated in New York, Geneva and other countries when opportunities arose. In 2017, UN Secretary-General António Guterres appointed Louise Arbour as his Special Representative on International Migration (SGSR) to implement the NYD. A distinguished Canadian jurist with a long career in international affairs, and a former UN High Level Commissioner on Human Rights, she was charged with coordinating the UN system for development of the GCM and the 2018 Intergovernmental Conference in Marrakech. She has led the UN advocacy efforts on international migration. Additionally, in 2017 the Secretary-General issued his report, “Making Migration Work for All” after the fact-finding period, the co-facilitators conducted Member State negotiations in week-long sessions in New York over a period of months. These sessions were different from most UN meetings where Member States read their speeches. Here at the urging of the co-facilitators, the States actually interacted directly with each other, suggested content and compromise language, discussed ways around obstacles — in other words — held real negotiations. Report. Unfortunately, resistance to migrants and refugees has gained ground since 2016. From the time the NYD was adopted until July 2018, when the Final Draft of the GCM was approved, the flow of migrants and refugees grew and European States who had at first welcomed them, found themselves in many cases overwhelmed by the increasing numbers of people arriving on their shores, primarily from Africa or the Middle East. Governments who had welcomed newcomers found themselves weakened. Those who once saved refugees and migrants from boats floundering at sea now refused to allow migrant boats to enter their ports. As a result, the environment for adoption of the GCM shifted. What started with the aspirational commitments of the NYD in 2016 turned at the later stages of the GCM negotiations in 2018, to efforts by some Member States to backtrack on the NYD commitments. They asserted that certain migrant protections in the document were “red lines” for them. Those included firewalls – which would keep migrants immune from arrest when seeking to access social services or court protections – and non-refoulement. Non-refoulement is based in the 1951 Convention on the Status of Refugees, stating that refugees should not be returned to a country where they face serious threats to their lives or freedom. Some Member States claimed that this principle could only apply to refugees and should not be included in the migration compact. The Co-Facilitators refuted these assertions. Despite the fact that the proposed compact is a non-legally binding document, certain Member States have from the beginning complained about its intrusion on their sovereignty. Other States later joined them in this argument. The international community has undertaken a strong eﬀort to produce the ﬁrst global compact on international migration. 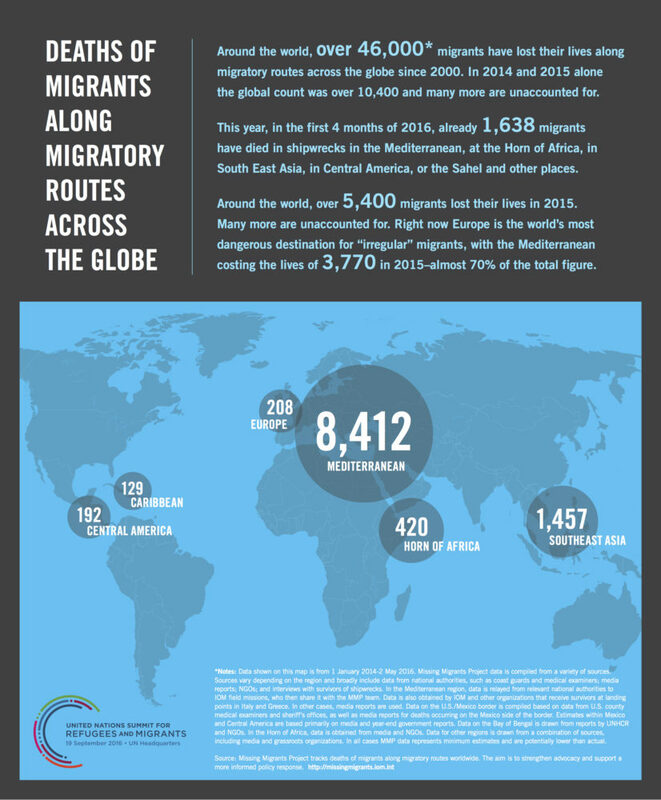 The GCM provides a 360-degree view of the entire migration experience. It places individuals at its core. It emphasizes the human rights of all migrants whether their status is regular or irregular and at every stage of migration. It seeks to improve global cooperation on migration and to unite rather than divide nations. It also aims to mitigate the causes of migration in countries of origin and anticipates return to those countries by migrants. Despite some changes in language to enable Member States to approve the Final Draft Outcome Document, the GCM remains a crucial document for safe, orderly and regular migration. When implemented, it will improve the lives of migrants everywhere, and boost the economies of their countries of destination and their countries of origin as well.